The United States won their first Fed Cup title for 17 years after emerging victorious in a thrilling dual with hosts Belarus in Minsk today. Coco Vandeweghe and Shelby Rogers prevailed against Aryna Sabalenka and Aliaksandra Sasnovich in the decisive doubles rubber after the scores had been level at 2-2 after four singles matches. Vandeweghe, the world number 10, had earlier put her side ahead with a 7-6(5), 6-1 win over 78th ranked Sabalenka in the opening match of the day. US Open champion Sloane Stephens then moved them within a set of the title against Sasnovich. Her opponent hit back, however, to win 4-6, 6-1, 8-6 and force a decider. The American duo won the first set 6-3 in the doubles to once again move to the cusp of victory. At 2-5 down in the second set, they were struggling, but a remarkable turnaround saw them prevail 7-3 in the tie-break for a straight sets win. 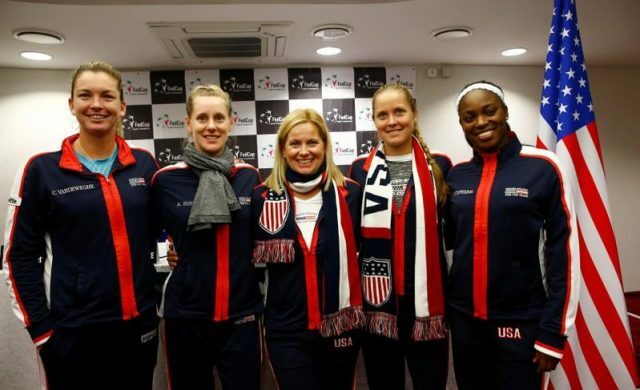 It marked the first US victory at the showpiece women’s team event since Lisa Raymond, Lindsay Davenport, Monica Seles and Jennifer Capriati in 2000. The triumph, which was achieved without both Venus and Serena Williams, marked a record 18th success for the US. Belarus, chasing a first-ever win, performed admirably after also being deprived of one of their star players in Victoria Azarenka, with the former world number one currently engaged in a custody battle. She is currently barred from taking her 10-month-old son Leo out of California, leaving her unable to compete.